Anna Thiessen was born on January 26, 1892, to Jacob W. Thiessen (1868–1933) and Helena Siemens (1870–1939) in Vassieljewka, Russia as the oldest child. The family emigrated to Manitoba in 1903, and finally settled in Saskatchewan in 1906. Anna spent two years at the Herbert Bible School from 1913–1915. When she was finished her schooling she was hired by William J. Bestvater who, originally from Mountain Lake, Minnesota, founded a mission in the city of Winnipeg in 1913. The original six month position included door to door visitations, recruiting children for Sunday school, bringing food and clothing to those in need, visiting the sick, and leading Sunday school. Her term was extended which became eight years. In 1923, she went to the Bible School of Los Angeles (BIOLA), for two years to improve her English and Biblical knowledge. After graduation she returned to work at the city mission, now directed by C.N. Hiebert. She began to work with immigrants in the city – some of whom were there to find work and repay their immigration debts. Thiessen recognized that these young women needed help in living and work arrangements. The Canadian Mennonite Brethren Conference saw the validity in Thiessen’s work and provided her with some support. She worked with this mission until 1925, when she began her time with the Mary Martha Home. The Mary Martha Home in Winnipeg was established in an effort to assist Mennonite young women who came from the rural areas to Winnipeg to work in domestic service. The Mennonite Brethren conference supported Anna Thiessen in 1925, as the matron of the home who provided a home away from home for these young women. The name Mary Martha was also used at a girls home in Los Angeles where Anna had gone to Bible School. Gatherings were held on Sundays and on afternoons off at the home on Burrows Avenue. The home experienced a constant flow of traffic of young women coming into the city for work, dropping in on their day off, or perhaps recuperating from illness. The home founded an association called “Tabea Verein” which focused on giving women a way of meeting with others in the same position, with some of the same concerns. At its height the home was associated with 150 to 200 women working in Winnipeg. Anna Thiessen filled the role of a friend, sister, and surrogate mother. She provided for the spiritual, emotional, and physical well being of the girls. In 1932, the Mary Martha Home was permanently housed in a sixteen room house on Mountain Avenue. In 1955 she wrote the history of the Mary Martha Home in a book entitled Die Stadtmission in Winnipeg, which was translated in 1991 entitled The City Mission. The home remained in operation until 1959. Anna Thiessen died on April 1, 1977. This material was donated by Doug Schulz. His mother, Martha Schulz (Martha Thiessen), was a sister to Anna Thiessen and inherited the materials after Anna’s death. The translation of the manuscript by Ida Towes was passed on to the Centre for publication. When the first 38 photographs were donated to the Centre is unclear. The material in this collection consists of Anna Thiessen’s diaries and notebooks which show a deep conviction for serving God and remaining faithful to Him. Thiessen was considerably influenced by her time at BIOLA and continued to receive Bible study material from the school on topics such as prophecy included in this collection. A photograph album shows the school, students, teachers and programs of the school. Most of her time was spent in Winnipeg at the Mary Martha Home where she received a substantial amount of correspondence from family and friends, giving day-to-day reports but also encouraging her in her work. Numerous photos of her work at the home are included. Another favourite inspirational resource for her was poetry and other short articles for various sources, which are preserved in this collection. Described by Conrad Stoesz December 10, 1999, updated November 2, 2004. Organizations collection, Mary Martha Home. CMBSC Oral History Project, 1987. Photograph collections: Sara Klippenstein NP32-3 (135 items), Tabea Verein NP54 (1 item), John and Helen Doerksen NP 125-1 (Items #1, 3, 7). 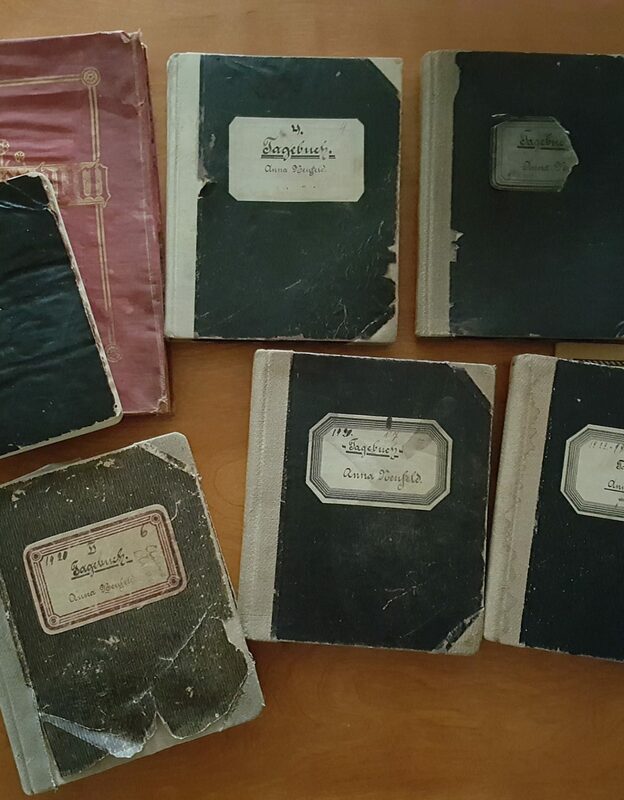 Herbert Bible School fonds, report cards and note books of Anna Thiessen. – 1913–1915. 1. Anna Thiessen diary. – 1915–1917. 2. Anna Thiessen diary. – 1926–1930, 1940–1944. 3. Anna Thiessen notebook and diary. – 1949, 1957, 1970, 1972. 4. Anna Thiessen diary and sermon notes. – 1962. 5. Anna Thiessen prayer and praise diary. – 1965. 6. Anna Thiessen diary. – June 19, 1970–February 8, 1971. 7. Anna Thiessen diary. – 1971. 8. Anna Thiessen diary. – 1971–1972. 9. Anna Thiessen diary. – 1972–1973. 10. Anna Thiessen diary. – 1973–1974. 11. Anna Thiessen diary. – 1974. 12. Anna Thiessen diary. – 1975. 13. Anna Thiessen prayer and praise diary. – 1975. 14. Anna Thiessen diary. – 1975–1976. 15. Anna Thiessen diary. – 1976. 16. Correspondence to Anna Thiessen. – 1916–1922. 17. Correspondence to Anna Thiessen. – 1923–1929. 18. Correspondence to Anna Thiessen. – 1930–1935. 19. Correspondence to Anna Thiessen. – 1936–1940. 20. Correspondence to Anna Thiessen. – 1941–1950. Correspondence to Anna Thiessen. – 1956–1966. Correspondence to Anna Thiessen from her father. – 1915–1934. Poems, plays and speeches for Mary Martha Home events. – [1940–197-?]. Photo clippings from Anna Thiessen’s book Die Stadtmissions in Winnipeg. – 1955. Three Herbert Bible School notebooks and song books. – 1913–1915. Inspirational poems and newspaper clippings. – 1931–1975. Binder of inspirational poems and newspaper clippings. – 1951–1970. Photograph album of Anna Thiessen’s time at Bible Institute of Los Angeles (BIOLA). This album contains black and white photos and documents of Anna’s time at this institution. – 30 x 18 cm x 2 cm thick. – 1923–1925. Bible study resources and other articles from The King’s Business, a magazine published by BIOLA, collected by Anna Thiessen. Topics covered include prophecy, speaking in tongues, salvation, etc. – 1948–1969. Four inspirational books, Gedichte für besondere Gelegenheiten/ Frau Suse Unruh; Wir Wollen auch ein Verslein fagen! ; 1926, Biblische Geschichten/ Ludwig Wangemann, 1918; Re-bound, Unidentified book with forward by C.H. Spurgeon. Translated manuscript of Anna Thiessen, The City Mission in Winnipeg, Ida Toews translator, 1985; Obituaries and an article from the Mennonitische Rundschau. – 1950,1977. Photo collection NP45–1. Anna Thiessen collection. NP45–1:1. Rev. J. Warkentin. – 1911. – 8 x 10 cm. This photo is portrait of Rev. J. Warkentin. NP45–1:2. Two unknown men standing outside during winter. – [193-?]. – 8 x 5 cm. This photo is of two men standing outside on a street during winter with houses and a horse and sleigh in background. NP45–1:3. House, church steeple in background. – [193-?]. – 11 x 9 cm. This photo is of a house on a street corner with a woman walking down the wooden side walk toward a church in background. NP45–1:4. The William J. Bestvater family. – [192-?]. – 16 x 12 cm. This photo has been taken out of a book or newspaper. It is a family portrait of the William Bestvater family, his wife and seven children. NP45–1:5. Eduard Horch family. – [193-?]. – 16 x 11 cm. This photo is a family portrait of Eduard Horch, his wife and six children. NP45–1:6. Unidentified mother with four small children. – [193-?]. – 9 x 14 cm. This photo is a portrait of an unknown mother and her four young children. NP45–1:7. Hamburger children, Winnipeg. – [193-?]. – 9 x 14 cm. This photo is of five young Hamburger children. NP45–1:8. Anna Thiessen. – 1918. – 8 x 14 cm. This photo is a portrait of Anna Thiessen. NP45–1:9. Anna Thiessen and some of the girls from the Mary Martha home. – 1919. – 8 x 14 cm. This photo is a portrait of Anna Thiessen and six girls from the Mary Martha Home. NP45–1:10. Helena P. Neufeld, Mary N. Schroeder, and Anna Thiessen. – [192-?]. – 14 x 9 cm. This photo is a portrait of Helena Neufeld, Mary Schroeder, and Anna Thiessen. NP45–1:11. Hilda. – 1924. – 9 x 14 cm. This photo is a portrait of Hilda and sent to Mrs. Anna Thiessen. NP45–1:12. Sunday School. – 1916. – 25 x 16 cm. This photo is of Sunday School children and adults at the Mennonite Brethren church at the corner of Manitoba and McKenzie, Winnipeg. NP45–1:13. The first choir of the Mennonite Brethren church on the corner of Manitoba and McKenzie in Winnipeg. – 1916. – 22 x 17 cm. This photo is a portrait of the first Mennonite Brethren choir. Back row: Gottlieb Wensel, Schulz, Bestvater, Janke. Middle row: Oehme, Lina’s Mutter, Anna Thiessen, Anna Redecopp. Front row: Olga Klee, Lina Oehme, Tina Loewen, Adela Rosen, Philip Hamburger. NP45–1:14. Anna Thiessen and children meeting at the Mennonite Brethren church on Manitoba and McKenzie. – 1916. – 25 x 20 cm. This photo is of a large group of Sunday School children and Anna Thiessen. NP45–1:15. Anna Thiessen and the sewing class. – 1916. – 25 x 20 cm. This photo is a portrait of Anna Thiessen and a large group of girls in sewing class. NP45–1:16. Unidentified group of ten girls. – [192-?]. – 11 x 6 cm. This phot is a picture of ten young girls standing outside in front of a brick building. NP45–1:17. Tena, Alma, Linda, Olga. – [192-?]. – 14 x 9 cm. This photo is of Tena, Alma, Linda, and Olga standing outside in front of a tree. NP45–1:18. Group of adult men and women. – [192-?]. – 14 x 9 cm. This photo is of a group of adult men and women sitting inside. Anna Thiessen front row, far right. NP45–1:19. Bible school at North End Chapel, Anna Thiessen front row, second from right. – 1920. – 14 x 9 cm. This photo is of a large group of adults standing inside a building. NP45–1:20. Unidentified group of girls with Anna Thiessen and Mary N. Schroeder at the North End Chapel. – [192-?]. – 25 x 20 cm. This photo is of a large group of children outside the North End Chapel with Anna Thiessen and Mary Schroeder. NP45–1:21. Anna Thiessen and a group of girls. – [192-?]. – 14 x 9 cm. This photo is a portrait of a group of eleven girls with Anna Thiessen. NP45–1:22. Unidentified group of girls and Helena P. Neufeld. – [192-?]. – 18 x 12 cm. This photo is a portrait of eleven girls and Helena Neufeld. NP45–1:23. North End Chapel on Burrows and Andrews. – [192-?]. – 12 x 8 cm. This photo has been clipped out of a book or newspaper and is of the North End Chapel. NP45–1:24. Mr. and Mrs. Erdman Nikkel and family. – [192-]. – 9 x 14 cm. This photo is a portrait taken out of a book or newspaper and is of Mr. and Mrs. Erdman Nickel with their five young children. NP45–1:25. Rev. Jacob W. Thiessen, Herbert, Saskatchewan. – [192-?]. – 6 x 11 cm. This photo is of a baptism service outdoors performed by Rev. Jacob Thiessen, in Herbert Saskatchewan with a large group of onlookers. Anna Thiessen standing far right. NP45–1:26. C.N. Hiebert and family. – [192-?]. – 16 x 11 cm. This photo is a portrait cut out of a book or newspaper of Mr. and Mrs. C.N. Hiebert and their seven children. NP45–1:27. Rev. A.B. Peters. – [192-?]. – 7 x 8 cm. This photo is a portrait of Rev. A.B. Peters. NP45–1:28. Mr. and Mrs. W. Falk and family. – [193-?]. – 9 x 14 cm. This photo is a portrait of Mr. and Mrs. Falk and their four children. NP45–1:29. Young Girls In Christian Service (YGICS). – [192-?]. – 25 x 20 cm. This photo is a portrait of a large group of young girls. NP45–1:30. Women group at the Elmwood MB church. – [193-?]. – 25 x 19 cm. 2 copies. – Note: for negative see NP25–7–64. This photo is a portrait of adult women at the Elmwood Mennonite Brethren church. Back row: Anna Baerg, Peter Dyck, Aganete Isaak, helena lage, Augusta Willms, C.A. DeFehr, A.H. Unruh, Wihl. Neufeld, Helena Martens, Maria Unruh Sarah Penner. Second row: Hulda Seifried, Katharina Wiebe, Mary Goertze, Hulda Witzke, Helene Hibert, Maria Krammer, B.B. Fast (Leiterin) Sarah Plett, Elisabeth Klassen, Lydia Enns, W. Enns, Justina Enna. Fourth row: Aganetha Wiebe, Elisabeth Martens, Katharina Voth, Neta Dahl, Elisabeth Willms, Anna Thiessen, D.K. Doerksen, Helena Dahl, Regehr. NP45–1:31. Rev. and Mrs. B.B. Fast. – [194-]. – 9 x 8 cm. This photo is a portrait cut out of a book or newspaper of Rev. and Mrs. B.B. Fast. NP45–1:32. Rev. and Mrs. D.K. Duerksen. – [195-]. – 9 x 7 cm. This photo is a portrait cut out of a book or newspaper of Rev. and Mrs. D.K. Duerksen. NP45–1:33. Elmwood Mennonite Brethren Church building. – 1954. – 16 x 13 cm. This photo has been cut out of a newspaper and is of the Elmwood Mennonite Brethren Church building. NP45–1:34. Service at the Elmwood MB church with congregation and choir. – [195-?]. – 17 x 13 cm. This photo has been cut out of a book or newspaper and is of a service inside the Elmwood MB church. NP45–1:35. Group of older women. – 1967. – 25 x 16 cm. This photo is of a group of elderly women. Back row: J. Derksen, K. Wiebe, G. Sukkau, K. Thielman, H. Klassen, N. Issak, A. Kroeker, E. Martens, A. Wiebe, I. Goertz. Second row: E. Stein, M. Harder, J. Klassen, A. Bergen, B. Fast, S. Plett, G. Isaak, C. Regehr. Front row: E. Rempel, A. Enns, H. Hiebert, E. DeFehr, P.Dahl, P. Dueck, A. Thiessen, B. Enns, G. Peters. NP45–1:36. Abraham and Anne Schellenberg. – [197-?]. – 13 x 9 cm. This photo is of Abraham and Anne Schellenberg. NP45–1:37. Group of elderly women in a church. – April 1977. – 25 x 10 cm. This photo is of a group of former residents in the “Mary Martha Home”, Winnipeg, which Mrs. Anna Thiessen supervised for many years (1925–1959). Taken at her funeral in the Elmwood Mennonite Brethren church. NP45–1:38. Slide of #29, Young Girls In Christian Service. – [192-?]. – 5 x 5 cm. This slide is of NP45–1:29, This photo is a portrait of a large group of young girls. – Note: this slide has been placed with NP45–1:29. NP045–01:39. Mrs. Helena Thiessen and daughters. – ca. 1930. – 12.5 x 20 cm [b&w] in paper folding frame. This photo is of Mrs. Helena Thiessen (nee Helena Siemens) (1870-1939) and her daughters. From l–r seated is Anna Thiessen, Helena Thiessen. Standing unidentified. NP045–01:40. Inside the church McKenzie and Manitoba ave.. – 1916. – 23 x 18 cm [b&w]. This photo is of 12 men and women posing for a photo inside the church building at the corner of Manitoba ave. and McKenzie street. The address was 652 Manitoba ave. Beside the choir is a foot pump organ with German sayings on the clapboard walls. This photo is of the same group of people as NP045–01:13 which as identification of the choir members. Anna Thiessen in middle row second from left. NP045–01:41. Miss Mary Schroeder. – ca. 1920. – 25 x 20 cm [b&w]. This photo is of Mary Schroeder sitting with a group of 11 young girls posing for a photo in a [photo studio?]. This photo is an original of NP045–01:22 and NP066–03:5. NP045–01:42. Anna Thiessen. – 192-?. – 24.5 x 19 cm [b&w]. This photo is of Anna Thiessen sitting with a group of young girls posing for a photo in front of a backdrop. This photo is an original of NP045–01:21 and NP066–03:07. Anna Thiessen is seated front and centre. NP045–01:43. Choir in the North End Church. – 195-?. – 26 x 19 cm [b&w]. This photo is a clipping from a magazine publication. It is of a group of men, women and children standing and sitting in the choir loft of the North End MB Church. This group appears to be a choir. Second row from front, second from right is John C. Klassen. In the foreground are 2 plants and a globe of the world. NP045–01:44. Deutsches Mädchenheim Vancouver. – 194-?. – 25.5 x 19 cm [b&w]. This photo is of a large group of young women posing for a photo on the front yard of two houses in Vancouver. The house on the right has the number 6351. Second row from front, centre is an older woman with her head covered. This photo is an original of NP066–03:04. NP045–01:45. The current city mission committee. – 1956. – 17.5 x 13 cm [b&w]. This photo is of the city mission (Mary Martha Home) committee members. Front row l–r is William Falk, C.A. DeFehr, J.P. Neufeld, Katie Fast, John M. Schmidt, Abram Froese. Back row is A.H. Voth, Aron Peters, Johann Funk, A.H. Regehr, J.J. Krueger, D. Dyck, A.A. Hyde. NP045–01:46. Anna Thiessen and Helen Neufeld with young girl. – [194-?]. – 7.5 x 13 cm [b&w]. This photo is of Anna Thiessen (l) with Helen Neufeld (r) standing outside a building with a young girl posing for a photo. They have heavy coats on. – Note: this is an original of 66-03-3.